Phoebe Kendall is just your typical Goth girl with a crush. He’s strong and silent…and dead. All over the country, a strange phenomenon is occurring. Some teenagers who die aren’t staying dead. But when they come back to life, they are no longer the same. Feared and misunderstood, they are doing their best to blend into a society that doesn’t want them. The administration at Oakvale High attempts to be more welcoming of the “differently biotic.” But the students don’t want to take classes or eat in the cafeteria next to someone who isn’t breathing. And there are no laws that exist to protect the “living impaired” from the people who want them to disappear–for good. 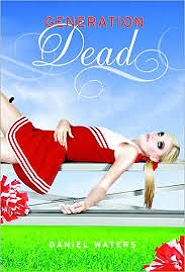 When Phoebe falls for Tommy Williams, the leader of the dead kids, no one can believe it; not her best friend, Margi, and especially not her neighbor, Adam, the star of the football team. Adam has feelings for Phoebe that run much deeper than just friendship; he would do anything for her. But what if protecting Tommy is the one thing that would make her happy?